Every year we service over 1,500 Clients for Lawn Aeration, Summer Mowing, & Raking in the Colorado Springs Area. Our good name, hard work, & professional guarantee has kept us going strong since 2001. To see a full list of what we offer, please visit our Services Page. Leaf Clean Up Scheduled by Text or Email 10% Off ! Leaf Pick Up is charged at our Hourly Rate vs. Power Raking is charged at a Flat Rate. The reason for this is because although the processes are similar, they are 2 different services. 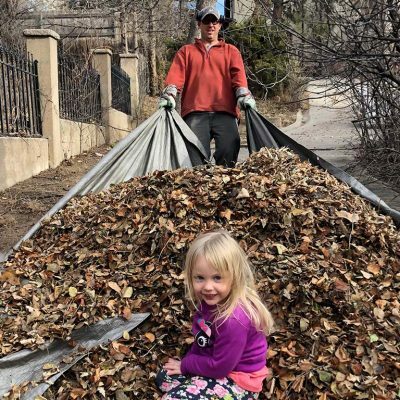 Leaf Pick Ups involve the whole property as Power Raking involve grass areas only. Grass areas can tend to be around the same sq. ft. even with varying lot sizes vs. varying size lots or lots with more trees take longer to Pick Up Leaves throughout the entire property. We always remain conscientious of our time and will do everything possible to get through Leaf Pick Up Jobs as quickly as we can to keep your cost low. Green Grass Clippings are the only material we haul with us at no additional charge because Green Grass is free for us to dump as it gets recycled into fertilizer at a garden shop. Other non-green lawn debris such as leaves, pine needles, etc. are usually bagged and left on your property for your own residential trash service. If requested, we can haul away with an additional cost. If hauled, we are charged commercial rates for disposal at dumping sites vs. you are charged residential rates with trash service, which is always much cheaper. Pricing can vary depending on material but typically the cost is around $35 per truck load. We use commercial Ryan Machines in which we apply approx. 50 lbs. extra weight past the manufacturer’s weight design. Small plugs are results from a dry/hard lawn that was not properly watered beforehand. No matter how much pressure or weight is applied, softer/ moisturized soil will always produce better aeration plugs. All lawns are overlapped heavily for lots of holes. Unmarked sprinkler heads are not our responsibility. We do the best we can to look out for unmarked sprinklers, however as a precaution we suggest marking all sprinkler heads or at minimum marking all heads that stick out more than 4-5 inches from the perimeter. We do not offer any commercialized fertilizers or any commercial lawn treatments. If we apply fertilizer, we do offer basic granular, child & pet friendly fertilizer such as Scotts Turf Builder*, a Nitrogen Fertilizer (Spring) or Nitrogen & Potassium Fertilizer (Fall) Even with child & pet friendly fertilizer please use caution. Water fertilizer after application to avoid lawn burning. Flat Rate Pricing is based on a $70 per hour model for Average Size (any yard below 3,500 sq. ft ) & Large Size (any yard over 3,501 sq. ft. & under 5,500 sq. ft.) Residential Yards. Pricing does not usually reduce if the yard is “smaller than average.” However, if the yard is “extremely small”, well under 1,000 sq. ft., we may discount. For Residential Yards over 5,500 sq. ft. or Small Commercial Accounts, Flat Rate Pricing does not apply and Pricing will be subject to a Quote based on $70 per hour. For example, the Average Yard serviced regularly takes about 30-45 minutes, therefore our flat rate charges average around $35-$50. For Larger Properties or Services that are not listed under Flat Rate Pricing, taking longer than average, 45-60 minutes & above, we then charge accordingly, $50 – $70 or more, depending on the service. Give us a call, send us a text, or email us today and let’s set an appointment! Intermountain Lawns has provided lawn maintenance services in the Colorado Springs area since 2001. We have always been a locally owned & operated small family business. We love small business and we love Colorado Springs.